Crime series are all about tying up loose ends, which means you need a lot of loose ends to start with. In that regard, and many others, Unforgotten doesn’t disappoint. A skeleton is discovered under a basement floor and DCI Cassie Stuart and DS Sunil ‘Sunny’ Khan are assigned the case. 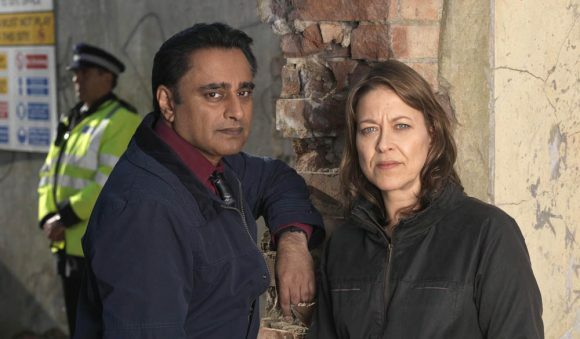 DCI Stuart is played by Nicola Walker, who previously played a cop – mostly dead – in the superb series River, and Sanjeev Bhaskar, of The Kumars at No. 42 fame (how he must hate reading that sentence) is her offsider, Sunny. Ten minutes in and we have, through a series of apparently unrelated scenes, a lengthy list of suspects: an old guy in a wheelchair, a woman nurturing a young soccer player, a businessman in line for some lucrative government work and a priest who needs some money for a special project. It’s obvious one of them’s done it – the only trouble is done what, done it how, and done it why? Oh yeah, and done it when? The ‘when’ is the first tricky part. It’s not quite, as DCI Stuart wonders in the beginning, another Richard III unearthing, but working out how long the bones have been there is going to take some, well … detective work. Luckily, there’s a couple of clued-up forensics on the case, who take some pride in their work and some perverse pleasure in stringing out the reveal as long as possible. Fair enough too. But before she can do that, there’s a lot of unravelling, and then ravelling back up to do. Just as well then that Unforgotten is beautifully shot, which will come up nicely on Prime’s new HD service. “At times Unforgotten teetered on the edge of cliché, not least in scenes of sub-CSI awe at the wonders of forensic science. That it never toppled fully into crime drama déjà vu was thanks to the strong, multi-stranded storytelling style of writer Chris Lang, who kept a swarm of supporting characters buzzing around on the sidelines.” — The Telegraph. “It was just a little tricky to keep hold of all these threads, slowly weaving their way to become the warp and weft of a gripping mystery – but that they did, eventually, do … Unforgotten, in other words, resolved itself by the close of its first episode into a promising whodunnit. It just took a bit too long to own up to the fact.” — The Independent. “The first episode of Unforgotten made an indelible mark … It’s extremely good storytelling, throughout, in fact, carefully-paced, beautifully acted. A reminder, in case we’d forgotten, how good TV crime drama can be.” — The Daily Express.